‘gentrification’. You virtually refrain from corroborating your statement with hard facts beyond your repeated statement that the managers of the building exhibition show ‘goodwill’ and that it is their ‘declared aim’ to not drive out the ‘local residents’. We were quite surprised to read this. Judging by a few of your texts which we have studied, it was our understanding that it is your intention to point out a growing polarization as a result of the development of ‘global cities’. Squat “Gromada” was created in the centre of Cracow, near the main railway station, in the district, which is particularly attractive for developers. For many years the building was empty, so it’s condition is getting worse and worse. 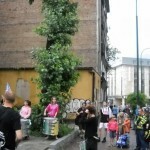 On the 12th of July group of activists in Cracow announced the official opening of the socio-cultural centre in this building. 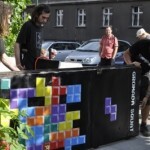 The event was accompanied with the Cracow Rhythms of Resistance. 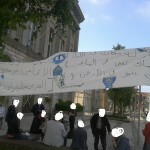 Activists organized a picnic for neighbours. 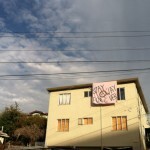 On Wednesday morning banners were dropped from a disused building belonging to the State on Rue de Quatre Coins reading ‘A Roof is a Right’ and ‘This is a legal squat’. The building had been occupied for many days beforehand, although clandestinely, and being safely past the 48 hour point, after which the police cannot enter or evict without a court order by French law, the occupants decided to make their occupation public. Police Nationale arrived shortly after but then left again to return with more police, but did not try to enter seemingly understanding their legal position and respecting the rights of those inside. A representative from the town hall also showed up, as well as a police forensics technician, who both took pictures of the door (and the legal notice that had been taped to it) but did not find anything to have been damaged and left again. However, the next day at 7:30 AM around thirty PAF arrived and forced entry into the building by breaking the front door and climbing in an upper story window. 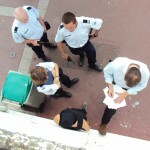 Three people who were inside were arrested and taken to Coquelle, where they were held without food for ten hours, but then released without any charge or summons despite refusing to cooperate with police or identify themselves. Occupied now for a month and a half, the squat on Boulevard Victor Hugo was visited by the city bailiff and a vanload of CRS yesterday so that they could take the name on the house and begin legal proceedings. 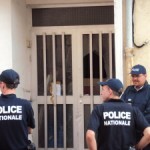 Today (June 18) the court in Calais declared the municipality’s request for the eviction of the squat on Rue Caillette “unreceivable” for procedural reasons. This means that the city will have to resubmit and argue their case all over again before being able to evict, giving those living there more valuable time before being forced back onto Calais’ streets. Here is an open letter which was submitted for the defence by the occupants. 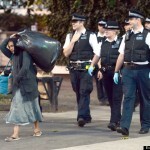 In picture: rubber-cloved police smirk as they chase away Roma in a dawn raid on 19 July against the Marble Arch encampment in London’s high-class Park Lane district, assisted by immigration officers and staff from the Romanian Embassy. Some seventy people, including children, had been sleeping in the open under blankets and plasic. Yesterday morning, Lambeth Council, the National Eviction Team and dozens of cops evicted 75 people from their homes in Rushcroft Road, Brixton. After 32 years, Lambeth Council has now decided to sell off the properties to estate agent giant and notorious tax dodger Foxtons. 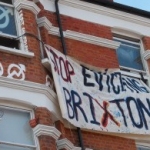 Fuelled by anger at the increasing gentrification of Brixton alongside Lambeth councils continuous failure to provide affordable housing, squatters, residents and locals put up a strong fight against the evictions. A very excellent eyewitness account of yesterdays events can be found here. And a Vice magazine article with some good pic’s here. 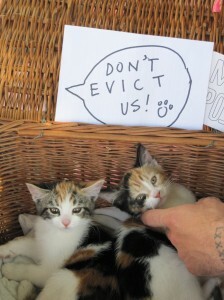 Rushcroft Road Eviction – this Monday 15th July. Join the people of the Rushcroft Road to stop Lambeth evicting Brixton. We are 75 people living in 6 blocks of residential flats in central Brixton who are facing eviction from our homes. Most of us have occupied and squatted the building for decades. One person has been here for 32 years. Generations of families have grown up here. Lambeth council have let these buildings go into a state of disrepair. We have made these buildings into our homes.